Analysis: Working his way back from a season-ending wrist fracture, Lindsay was limited to stretching and chatting with teammates during Tuesday's session. His availability for training camp doesn't seem to be much of a concern, but he'll likely remain limited throughout the offseason program, with his focus on learning a new playbook from offensive coordinator Rich Scangarello. The Broncos presumably envision a backfield with both Lindsay and fellow second-year pro Royce Freeman handling sizable roles. Lindsay (wrist) sported a brace instead of a hard cast at Wednesday's workout, Kyle Fredrickson of the Denver Post reports. Coach Vic Fangio said Lindsay (wrist) is unlikely to participate in the beginning of OTAs, Ryan O'Halloran of The Denver Post reports. Analysis: The Broncos have a bonus minicamp the week after the 2019 NFL Draft, and Lindsay likely will be watching from the sidelines. It's unclear if he''ll be able to participate in any part of the offseason program, but there doesn't seem to be concern about his availability for training camp. This injury shouldn't affect Lindsay's fantasy stock considering it's a wrist issue and not a lower-body problem. Lindsay (wrist) is still sporting a hard cast on his right arm and declined to comment Wednesday regarding his potential availability for OTAs, Nicki Jhabvala of The Athletic reports. Analysis: The rehab timeline was estimated at 3-to-4 months when the undrafted rookie sensation landed on injured reserve and had surgery after Week 16. His continued use of a hard cast doesn't mean he's behind schedule, but it suggests his weightlifting will be limited during the offseason. In any case, Lindsay should regain his health long before training camp, and perhaps even for OTAs or minicamp this spring. A wrist injury is far less concerning than any type of lower-body issue would be. Lindsay (wrist) finished his rookie campaign with 1,037 yards and nine touchdowns on 192 carries and another 241 yards and a touchdown on 35 catches over 15 appearances. Lindsay (knee) has been placed on IR, Nicki Jhabvala of The Athletic reports. Analysis: The move will allow the Broncos to fill Lindsay's roster spot in advance of Week 17 action. 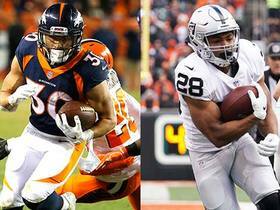 Per Mike Klis of 9News Denver, the running back is slated to undergo surgery on his right wrist later Friday. Initial reports have estimated Lindsay likely will require 3-to-4 months of recovery time, a timetable that would allow him to approach training camp next summer in good health and back atop Denver's RB depth chart at that time. Lindsay will likely require 3-to-4 months of recovery time upon undergoing right wrist surgery, Aric DiLalla of the Broncos' official site reports. Coach Vance Joseph confirmed Wednesday that Lindsay will undergo surgery to address a "serious" wrist injury, Ryan O'Halloran of The Denver Post reports. The right wrist injury that will force Lindsay to miss the Broncos' season finale Sunday against the Chargers involves torn ligaments around the scaphoid bone, Mike Klis of 9News Denver reports. Lindsay underwent an MRI on Tuesday that revealed ligament damage in his right wrist, Mike Klis of 9News Denver reports. He won't be available for the Broncos' Week 17 game against the Chargers and is unlikely to suit up for the Pro Bowl. Lindsay will undergo an MRI on his right wrist Tuesday, Mike Klis of 9News Denver reports. Lindsay will not return to Monday's game against the Raiders after suffering a right hand injury. 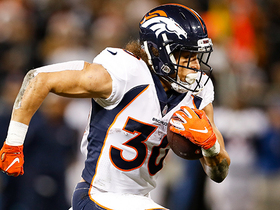 Analysis: Lindsay was the Broncos' leading rusher with 46 yards when he exited the game in the fourth quarter. The 24-year-old also had two catches for 11 yards. Royce Freeman and Devontae Booker will be expected to fill the void left by Lindsay for the remainder of Monday's game. Lindsay, along with teammate Von Miller, earned a Pro Bowl spot, Ryan O'Halloran of The Denver Post reports. Lindsay managed only 24 yards on 14 carries, adding four receptions for 20 yards during Saturday's 17-16 loss to Cleveland. Lindsay rushed 14 times for 30 yards and a touchdown and brought in four of seven targets for 21 yards in the Broncos' 20-14 loss to the 49ers on Sunday. Lindsay rushed for 157 yards and two touchdowns on 19 carries and added a 2-yard catch during Sunday's 24-10 win over the Bengals. 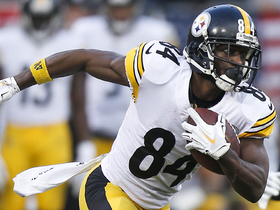 Lindsay registered 110 rushing yards and a touchdown on 14 carries during Sunday's 24-17 win against the Steelers. Lindsay rushed for 79 yards and two touchdowns on 11 carries and added four receptions for 27 yards on five targets Sunday in the Broncos' 23-22 win over the Chargers. Lindsay rushed for 60 yards on 17 attempts, adding two receptions for 24 yards during Sunday's 19-17 loss to Houston. 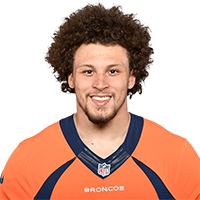 Lindsay will likely serve as the Broncos' lead back Sunday against the Texans with Royce Freeman (ankle), who is listed as questionable, not expected to play, Troy Renck of Denver 7 News reports. NFL Network Insider Ian Rapoport discusses Denver Broncos running back Phillip Lindsay's injured wrist and his status for Week 17 and the Pro Bowl. 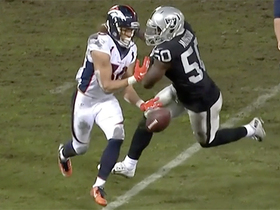 Denver Broncos running back Phillip Lindsay gets a lucky bounce on his run for a first down against the Oakland Raiders. 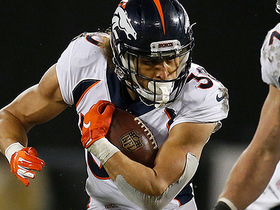 Denver Broncos running back Phillip Lindsay runs 11 yards to break the 1,000 yard rushing mark for the season. 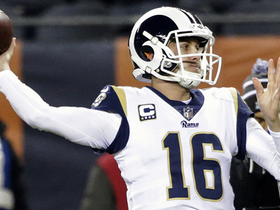 NFL Network's "NFL Fantasy Live" crew reveals their bold predictions for the Week 16 "Monday Night Football" matchup between the Denver Broncos and Oakland Raiders. Cleveland Browns quarterback Baker Mayfield and Denver Broncos running back Phillip Lindsay exchange jerseys after their Week 15 matchup. 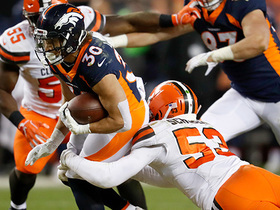 The Cleveland Browns defense clamps down on the Denver Broncos offense in the opening drive. 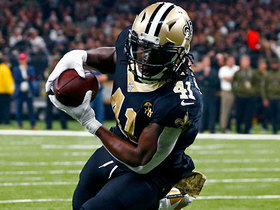 NFL Network's Marc Istook, Marcas Grant and Graham Barfield project fantasy points for four players in PPR leagues in Week 15. 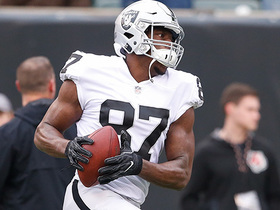 NFL Network's "NFL Fantasy Live" crew highlights must-start players in fantasy in Week 15. NFL Network analysts choose their must-start players to start during championship week in fantasy.